All hiking trails are on the western side of Kruger, in the South African sector o the Great Limpopo Transfrontier Park (in Limpopo Provincial Reserves). What’s the same with all the trails? 1. All trails are held in game reserves with Big5 and dangerous animals around. The reserves share unfenced boundaries with Kruger National Park and are in Limpopo provincial reserves. 2. 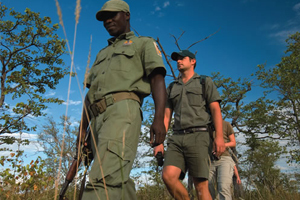 All trails are guided by an experienced and qualified armed guide, and backed up by an armed ranger. 3. All trails have walking as their only activity, and the exact route of each day’s hike is adapted and adjusted based on the weather and animal movements. 4. All trails are catered and, if required, portered. 5. All trails cover between 12km to 15kms per day. 6. All trails have a maximum of 8 hikers as their capacity. What is different about the various trails? 1. Terrain: The trails are offered in three different reserves. Each has a different environment. Letaba Ranch includes extensive riverine options and Makuya Park in the north provides a mountainous challenge with deep gorges and beautiful scenery. 2. Animals & Birds: The Mtomeni & Letaba trails will have possible animals at a distance, and the Makuya trail will have occasional sightings at a distance. Birding is good in all areas, but the Makuya Trail has the best birding. 3. Accommodation: The Mtomeni Trails offer a relatively luxurious accommodation option with permanent, en-suite safari tents, nice linen and hot water in the en-suite. The Makuya trail has a combination of the luxury and bush camping, while the Letaba Wilderness trail only offers pure bush camping. 4. 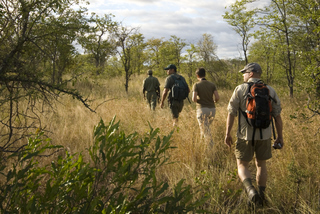 Number of participants: The Mtomeni Trails are offered for as few as 2 participants, with the Letaba Wilderness trail and Makuya Trail requiring a minimum of 4 participants to be offered. Explore the vast wonderland of the Great Limpopo Transfrontier Park. 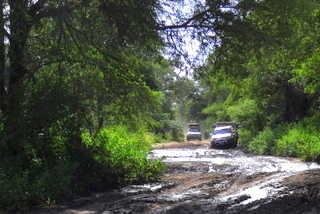 4×4 Eco-Trail offers challenging river crossings and the opportunity to navigate seldom travelled tracks. The glorious adventure of camping-out in this remote wilderness, at the edge of pans and river courses whilst listening to the night sounds of the African bush.